With the blooms at the Emu Valley Rhododendron Garden (EVRG) out in force it’s time to shout out for everyone to go for a visit. The vision of the EVRG is “… to be a world recognised woodland garden showcasing and protecting the Rhododendron Genus.” There is no doubt that it showcases rhododendrons magnificently (with a visit you can be a judge of this). Without doubt it protects them, with over 22000 rhododendrons growing on site and over 500 plants in the nursery (where they can spend up to five years before being ready for planting out). The recognition for the EVRG is building, much like a treasure someone doesn't know they have or don’t realise its full value, which is ever increasing as time goes by. I think the volunteers and members know they have something of great worth, as do rhododendron experts around the world, but much of Tasmania, the rest of Australia and the world have yet to discover it. 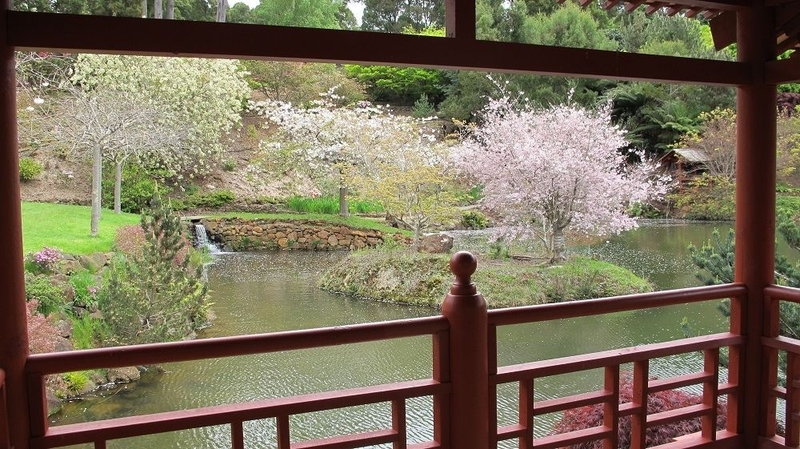 Just a ten minute drive south of Burnie on the North West coast, the gardens were originally part of a farm. The fairly steep section of land had never been farmed, but had been logged in the 1960’s with the resulting regrowth including lots of blackberries! From the first rhododendron being planted in 1981 to there now being more than 450 species from 16 countries, it is a living testament of just what can be achieved when like-minded people have a vision, set goals and go to work to achieve those goals. People pitched in the early days, as they do now. Back at the start the local cricket club felled trees and cut them up for firewood which went off to families in need. Nearby farmers used their time and tractors to clear parts of the land. With every visit we marvel at what has been created. 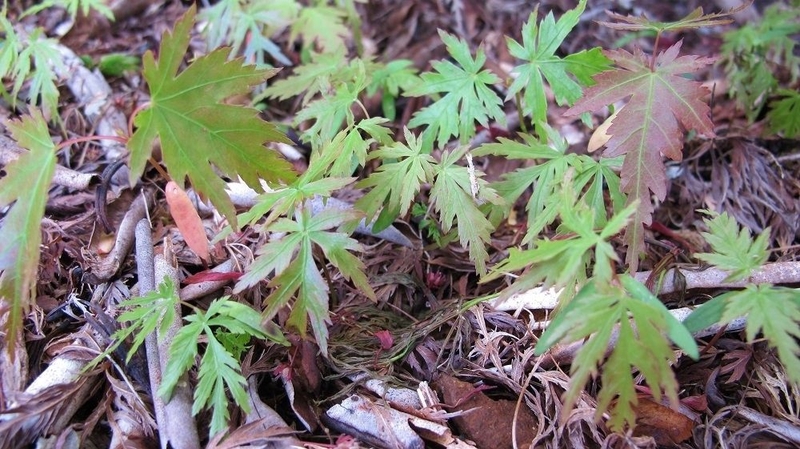 On our latest visit it was a delight to see many plants out in flower and many buds bursting at the seams, seemingly in a rush to show off what they have.There were hundreds of baby Japanese Maples carpeting the ground underneath their parent tree. The reflections in the lakes were refreshing and the covered bridge in the Japanese Garden makes for such a picturesque outlook, especially with the cherry blossoms out in force. There are many plants to see apart from the rhodos, with species that grow with them in their native home being planted as well. Being created in a natural amphitheatre, the many paths follow the contours of the land and go here and there leading you on a path of discovery. I stopped to take a photo –well a few- and my children went off ahead, then were gone. I wondered how long it would be before I’d see them again as the garden does have the delight of a maze with you not quite knowing what you might come across next and if you really knew where you are. 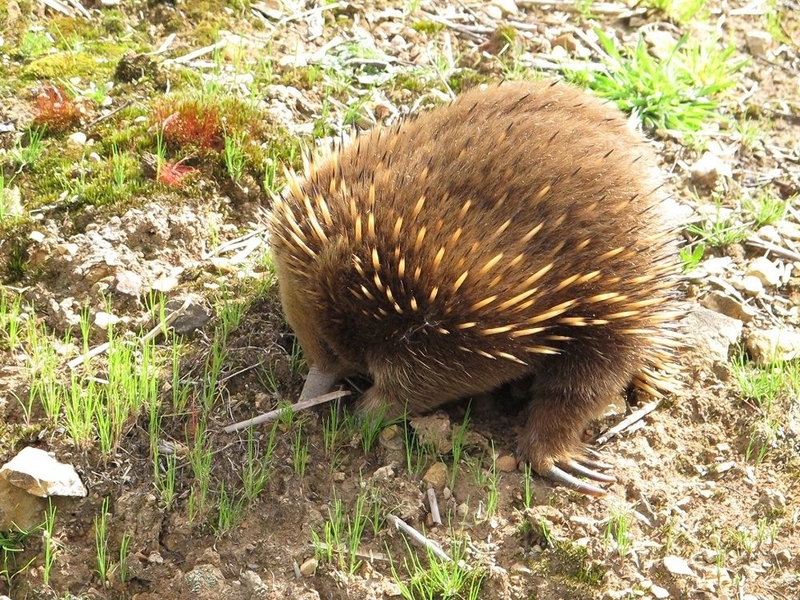 When I came across an echidna, I headed off looking for the teenagers, wondering if I’d be able to reach where I’d last seen them and then be able to return to the Chinese section of the garden where I’d seen the echidna. I found them and we returned to find the echidna still busy hunting around for insects and the like. Apart from the echidnas and many birds, there is also a resident platypus that lives in the largest lake. Near the echidna I met Heather who is a volunteer who, among other tasks, takes many beautiful photos of the garden. Heather said when her young grandsons visit her they always ask, "Can we go to the rhodo garden?" While we were there a minibus drove around the internal roads allowing residents of a nursing home from a coastal town to enjoy the sights. If you have problems walking very far, with prior arrangement, you can have a volunteer take you around in a motorised buggy. There are plenty of seats to sit and relax and enjoy the garden from. We met Lynette a volunteer who was cleaning the seats, so she would probably say there are too many seats! 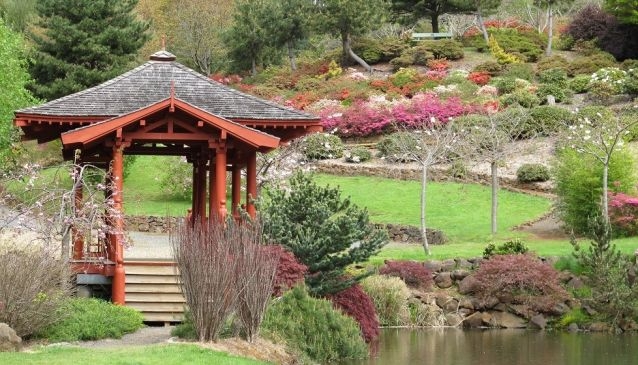 On Saturday October 12th, the Cherry Blossom Festival is on at the Emu Valley Rhododendron Garden. 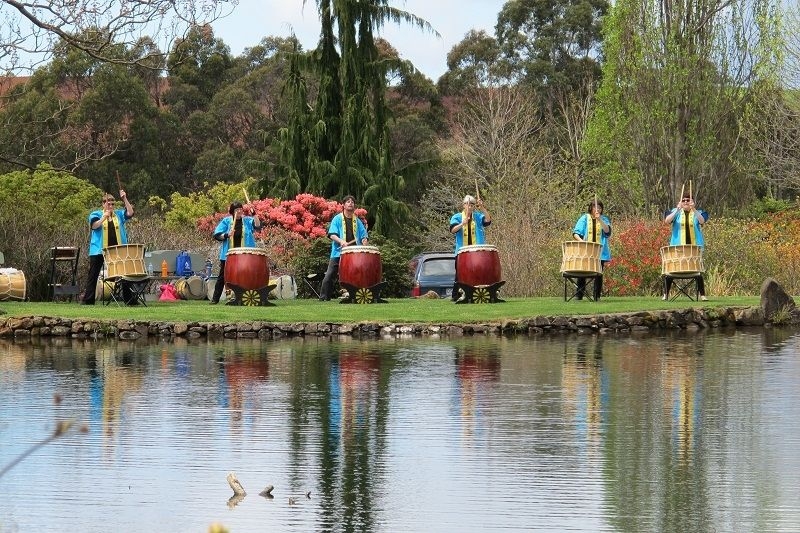 Timed to highlight the cherry blossoms at their peak, there will also be a performance from the Taiko Drummers, displays and demonstrations of Bonsai and Ikebana plus a sausage sizzle. Photos were all taken 10/10/2013 so this is what the garden looks like right now, with the exception being the photo of the Taiko Drummers which was taken at last years Cherry Blossom Festival on 13/10/2012.